The European market for hashish is currently one of the world’s largest and most profitable. About 647 tonnes of cannabis herb and 641 tonnes of hashish were consumed in the Euroean Union in 2013 and the retail market has an overall value estimated conservatively to be about EUR 9.3 billion in 2013. This analysis describes how the supply of cannabis resin in Europe is changing in response to competition and other market developments. Part of the ‘Perspectives on Drugs’ (PODs) series, launched as part of the European Drug Report package, these designed-for-the-web interactive analyses provide deeper insights into a selection of important issues. This POD is based on the recently launched EMCDDA–Europol EU Drug Markets Report. Cannabis resin, also known as hashish and charas, is a natural product obtained by separating and compressing the resin glands, or trichomes, of the female cannabis plant. Although other methods exist, cannabis resin is usually produced using either the hand-rubbing method or the sieving method. Depending on the separation method used, and on the skills and care applied by the producers, the product can be contaminated with different amounts of dirt and plant fragments and vary a great deal in appearance, texture, odour and potency. Adulterants may be added, usually to increase the weight and modify the appearance of the finished product. Cannabis resin, like cannabis herb, has been consumed for many centuries. In the early twentieth century large-scale production of cannabis resin was mainly centred on Kashmir, Afghanistan and parts of India, with Greece, Syria, Nepal, Lebanon and Turkey also becoming major producers and exporters. In the late 1960s production of sieved cannabis resin in Morocco became sufficient for exports (Clarke, 1998, p. 60). While small-scale hashish use has long existed in Europe (Lewin, 1998), a large market for the drug only started to develop during the late 1960s and early 1970s, supplied initially from Pakistan and Afghanistan with Lebanon becoming an additional source later on. When Europe’s supply sources were disrupted by the conflicts in Lebanon (1975–91) and Afghanistan (1979–89) large-scale commercial hashish production in Morocco increased. By the early 1990s the ‘soap bar’ (250 g) of poor-quality Moroccan cannabis resin held a quasi-monopoly over the western European market for cannabis products (Clarke, 1998; Appel, 2013). However, since the early 2000s a dramatic increase in cannabis production in Europe has led to a shift in the market, with domestically grown cannabis herb displacing imported (Moroccan) resin in many countries (EMCDDA, 2012). Nevertheless, although it has shrunk, the European market for hashish probably remains one of the world’s largest and most profitable. This paper describes how the supply of cannabis resin in Europe is changing in response to competition and other market developments, and what other changes might be expected in the future. Obtaining a clear picture of the European market for cannabis resin is hampered by knowledge gaps, and a lack of differentiation between resin and herb, and between the sources of the products, in some data. The commercial production and sale of cannabis products is likely to be a lucrative business, especially in Europe where the consumer base is very large. The prevalence of cannabis use far exceeds that of the other major drug groups in all European Union (EU) countries. Approximately 849 million European adults (aged 15–64) are estimated to have tried cannabis at least once in their lifetime. Use is higher among young adults (aged 15–34), with about 16.5 million individuals using cannabis in the last year (13.3 % of this age group). The EMCDDA also estimates that around 1 % of those aged 15–64 in the EU, or about 3 million people, smoke cannabis on a daily or near-daily basis. The EMCDDA has estimated that in 2013 about 647 tonnes of cannabis herb and 641 tonnes of hashish were consumed in the EU and the retail market had an overall value estimated conservatively to be about EUR 9.3 billion, or just under two-fifths of the illicit market for all drugs (EMCDDA and Europol, 2016). Such enormous financial stakes encourage the involvement of many actors, especially organised crime groups (OCGs). The supply of imported cannabis resin has traditionally been in the hands of organised crime, with Moroccan OCGs playing a central role in wholesale importation and distribution. Spain, the country traditionally seizing the largest quantities of cannabis resin in Europe, is the main entry point into Europe for the drug and is also a distribution point. The Netherlands and Belgium are traditional distribution hubs for EU markets, and for Russia and Belarus, while Denmark is a key distribution hub for the Nordic countries (EMCDDA and Europol, 2016). Although it is estimated that more herb than resin is consumed in Europe, the quantity of resin seized far outweighs herb. 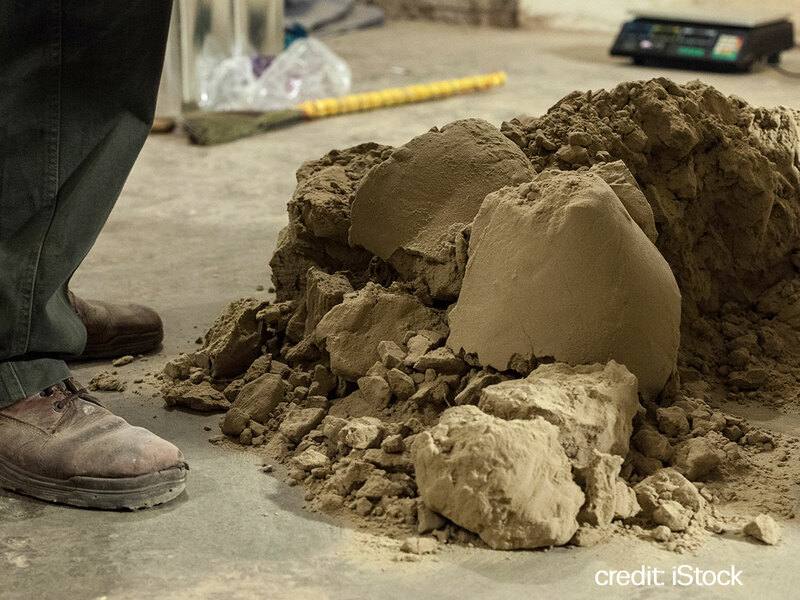 Adding the amount of hashish seized in the EU in 2015 (537 tonnes) to the amount estimated to be consumed in the EU suggests that approximately 1 200 tonnes of cannabis resin would be needed to supply the European market every year. Current evidence indicates that practically all of this comes from source countries located outside Europe. Information provided to the EMCDDA by the 30 national focal points of the Reitox network for the period 2008–10 indicated that Morocco was by far the most frequent source of cannabis resin imported into Europe (EMCDDA, 2012), and a review of the EMCDDA national focal point reports for 2012–14 shows a similar picture. However, while it appears that Morocco is still the largest foreign source of the cannabis resin available in Europe a number of significant changes to production in the country have recently been reported. There have been several indicators of major changes in the Moroccan hashish industry in the last decade or so. First, hashish production is reported to have declined sharply in Morocco and resumed in both Afghanistan (UNODC, 2010) and Lebanon (press reports; Servel and Zurayk, 2014). Indeed, United Nations Office on Drugs and Crime (UNODC) estimates suggest that cannabis cultivation in Morocco decreased by 65 % and hashish production by 75 % in less than 10 years. The area under cannabis crops in the Rif mountains, where cannabis is traditionally cultivated, is reported to have shrunk from an all-time high of 134 000 hectares in 2003 to 47 196 hectares in 2013 (1), with production falling from an estimated 3 080 tons in 2003 to 760 tons in 2011 (UNODC, 2003, 2013b, 2015). However, although the surface area dedicated to cannabis crops seems to have shrunk, other data suggest that the quantity of hashish produced in Morocco has probably not decreased commensurately. Morocco is still reported to be the main source of resin in Europe, and about 535 tonnes were seized in Morocco and the key transit countries of Algeria and Spain in 2011 (EMCDDA and Europol, 2016; UNODC, 2015). Second, the physical shape of the hashish products seized in Europe has changed. In the last few years, reports from some European drug law enforcement agencies suggest that the 250 g Moroccan ‘soap bar’ shape, previously the main form of hashish, is disappearing from European police seizures and is being replaced by 200 g melon-shaped balls, 100 g tablets, and 10 g olive-shaped pellets (Chouvy, 2016). Third, and most importantly, the potency of the cannabis resin seized in Europe in recent years has increased while prices have remained stable (see 3. Facts and figures). In France, for instance, while the traditional ‘soap bars’ showed a tetrahydrocannabinol (THC) content of 8 % on average, the Moroccan hashish seized in 2014 averaged 20.7 %, according to data from the French forensic service INPS (Cadet-Taïrou et al., 2015). Field research conducted in 2013 in the Rif mountains of northern Morocco, where cannabis resin production is concentrated, confirmed that the area under cannabis cultivation has decreased since 2003 (Chouvy and Afsahi, 2014). However, most importantly, the research also showed that the kif landrace (2) traditionally grown in the Rif is being largely replaced by cannabis hybrids of various pedigrees and origins, including from Europe, with radically different physical aspects and providing much higher resin yields; according to various Moroccan cannabis farmers, the new hybrids yield three to five times more hashish than kif. In addition, this new type of Moroccan hashish is more potent, which could explain why the THC content of the cannabis resin seized in Europe has increased in the last 10 years (see 3. Facts and figures). The ongoing widespread switch to hybrid varieties in the Rif is probably the main factor explaining why international hashish seizures conflict with hashish production estimates in Morocco — a two-third decline in area under cannabis crops since 2003 being offset by the three- to fivefold yield increase by switching to the new hybrids. Although no precise estimate is currently possible, it is clear that Moroccan cannabis resin production can no longer be estimated on the basis of kif-based yields (Chouvy and Afsahi, 2014). The switch to hybrids and the emergence of a new, more potent hashish in the Rif can be seen as a response to competition, facilitated by the availability of a wide range of cannabis hybrids. The Moroccan kif-based hashish industry has traditionally produced large quantities of lower quality hashish, the ‘soap bar’, which has a poor reputation among European consumers, and has suffered from competition from commercial European indoor crops of highly potent herbal cannabis. Moroccan producers interviewed in 2013 complained that they were finding it harder to sell their resin, which would appear a logical consequence of the large-scale shift in the European cannabis market from imported resin to domestic herb (Weinberger, 2011; EMCDDA, 2012; Chouvy, 2016). However, if OCGs encounter difficulties in selling Moroccan cannabis resin in Europe, once its traditional outlet, this might prompt them to increasingly target other markets, such as Russia and its non-EU neighbours, where Moroccan resin is already found. The Middle East, where large hashish markets have long existed, for instance in Egypt, is another potential target for Moroccan hashish and may help explain why very large shipments of Moroccan cannabis resin have been seized in recent years from ships sailing along the North African coast to eastern Libya (EMCDDA and Europol, 2016). Another potential area of change in the cannabis resin market is local production. So far, hash-making in Europe seems to be restricted to a few individuals who are very enthusiastic and knowledgeable about cannabis. Cannabis enthusiasts can now produce resin in Europe utilising expert extraction techniques, such as water-based or ice-based extraction devices, as well as resin extractors (3). This equipment can currently be purchased online from European suppliers. Some varieties of cannabis are even marketed by European online stores as especially suited for resin production. Chouvy (2016) conducted interviews with key informants with specialist cannabis knowledge, in France and Spain, and they raised the possibility that some so-called Moroccan hashish was not being produced in Morocco at all. Given the potential for know-how and equipment to spread beyond cannabis enthusiasts to OCGs, high-potency hashish could be produced indoors in European countries using modern extraction techniques, and be marketed as Moroccan hashish (Chouvy, 2016). Therefore, the issue of the provenance of seized resin becomes ever more complicated and hard to establish, bearing in mind that foreign hybrids are now replacing the kif variety in Morocco, extraction techniques are evolving, and hybrid cultivation and resin extraction can take place outside Morocco. This raises the question, what exactly is ‘Moroccan’ hashish? Would a resin produced in France, the Netherlands or Spain from the kif variety be called Moroccan hashish? What about a resin produced in Morocco from modern hybrids and using a resin extractor? What is clear is that Moroccan resin has recently changed from the decades-old kif -based hashish and is becoming less of a local and more of an internationalised product because of new cultivation patterns and, potentially, new production techniques. The cannabis market appears to be more diverse than ever before, with the potency of products, including resins, generally higher than in the past and a large proportion of the market now supplied by professional growers and OCGs. This is a far cry from the image associated with cannabis in the 1960s and 1970s. Morocco is likely to remain Europe’s main source of cannabis resin supply for some time, in spite of some inroads made by Afghan resin, and production methods are evolving to match market demand. However, the surge in production of cannabis plants in the EU in the past decade, the availability of modern methods of resin production and, importantly, the involvement of OCGs in the European cannabis market could lead to the manufacturing of potent forms of cannabis resin on a large scale in Europe, while Moroccan cannabis growers may seek new markets for their products elsewhere. Despite the rapid shift in the EU market towards herbal cannabis, monitoring the resin market remains important. (1) Cultivation estimates are given after eradication (8 000 hectares in 2011). The 2003 and 2005 estimates are based on joint surveys by Morocco and the UNODC while the 2012 estimate is based on data gathered unilaterally by the Moroccan authorities, then communicated to the UNODC. 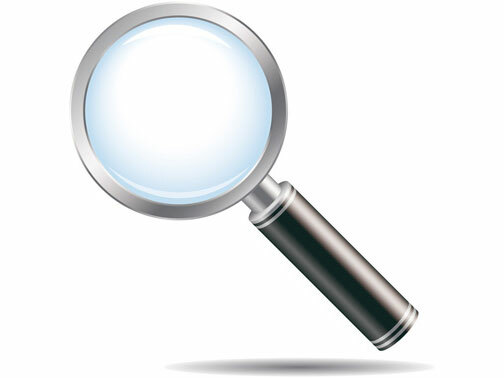 While the methodology used in the 2003 and 2005 surveys are presented in the UNODC reports, no information is available as to how the 2012 and 2013 data were produced. (2) A landrace is an old cultivar that was geographically isolated from others and has developed largely by natural processes, by adapting to the natural and cultural environment in which it grows. kif is the name given to the cannabis plant in Morocco. (3) Resin extractors (often incorrectly referred to as ‘pollen extractors’) are machines that allow the separation of resin-rich trichomes from plant material in a fast and effective way. The resin produced in this way apparently contains little leaf material, dirt or other impurities. 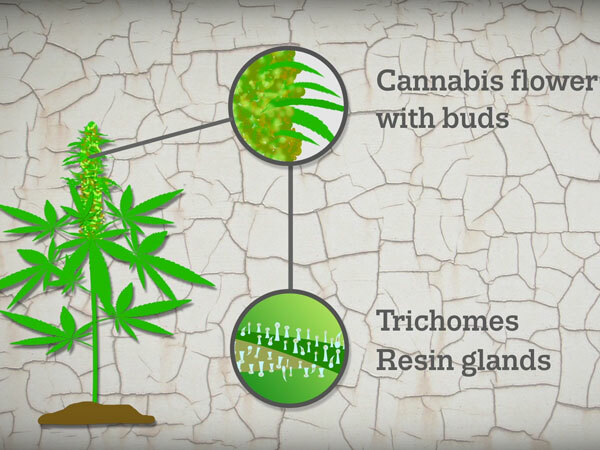 If high-potency cannabis plants are used, the resulting resin is also high potency. Appel, L. (2013), ‘La guerre du cannabis entre dans les jardins (1)’, Criminalités 4, February. Cadet-Taïrou, A., Gandilhon, G., Martinez, M. and Néfau, T. (2015), ‘Psychoactive substance use in France: Recent trends (2014–2015)’, Tendances 106, OFDT, December. Chouvy, P.-A. (2016), ‘The supply of hashish to Europe’, background paper commissioned by the EMCDDA for the 2016 EU drug markets report. Chouvy, P.-A. and Afsahi, K., (2014), ‘Hashish revival in Morocco’, International Journal of Drug Policy 25(3), pp. 416–423. EMCDDA (2012), Cannabis production and markets in Europe, EMCDDA Insights 12, Publications Office of the European Union, Luxembourg. EMCDDA and Europol (2016), EU drug markets report: In-depth analysis, EMCDDA–Europol Joint publications, Publications Office of the European Union, Luxembourg. Lewin, L. (1998) [1924 in German], Phantastica: Narcotic and stimulating drugs, Park Street Press, Rochester. Servel, H. and Zurayk, R. (2014), ‘Marché, pouvoir et jeux de rôle : le Rouge libanais résiste dans la vallée de la Beqaa’, paper presented at Colloque international SFER AGP 2014, Agriculture et géopolitique, rivalités-puissance-coopération, Guyancourt, 12–13 February. UNODC (United Nations Office on Drugs and Crime) (2010), Afghanistan Cannabis Survey 2009, United Nations Office on Drugs and Crime, Vienna. UNODC (2013a), Afghanistan: Survey of commercial cannabis cultivation and production 2012, United Nations Office on Drugs and Crime, Vienna. UNODC (2013b), World drug report 2013, United Nations Office on Drugs and Crime, Vienna. UNODC (2015), World drug report 2015, United Nations Office on Drugs and Crime, Vienna. Weinberger, D. (2011), ‘Criminal networks and indoor cannabis in Europe: Has the phenomenon reached France?’ Drugs, International Challenges 1, OFDT, May. Note: Trends are based only on data from those EU countries that have submitted data consistently since 2011. Prices have not been adjusted for inflation. Typical values shown are the interquartile range (IQR) of the country average values, with high and low values showing the range. The Netherlands and, probably to a lesser extent, Belgium are traditional distribution hubs of cannabis resin, for instance to Scandinavia via Germany, or to Russia and Belarus via Poland and the Baltic countries. Hashish is also distributed from Denmark to the Nordic countries. Many shipments of resin destined for the French market are organised in and dispatched from Spain. Italian Camorra mafia groups organise cannabis resin shipments from Spain to Italy, either directly or via the Netherlands. A recent and potentially significant development in the trafficking of cannabis resin from Morocco is the use of ships that transport the resin eastwards on the Mediterranean Sea to the Libyan region of Cyrenaica bordering Egypt, where shipments of Lebanese hashish are also sent. This is illustrated by several large seizures in the region. Europol and the Maritime Analysis and Operations Centre — Narcotics (MAOC-N) report that in recent years they have been actively involved in the seizure of almost 400 tonnes of Moroccan cannabis resin off the coast of North Africa, at least some of which is thought to have been destined for European drug markets. A link has also been made between this maritime trafficking and the facilitation of illegal immigration to Europe, although the specifics of this are not well understood at present. 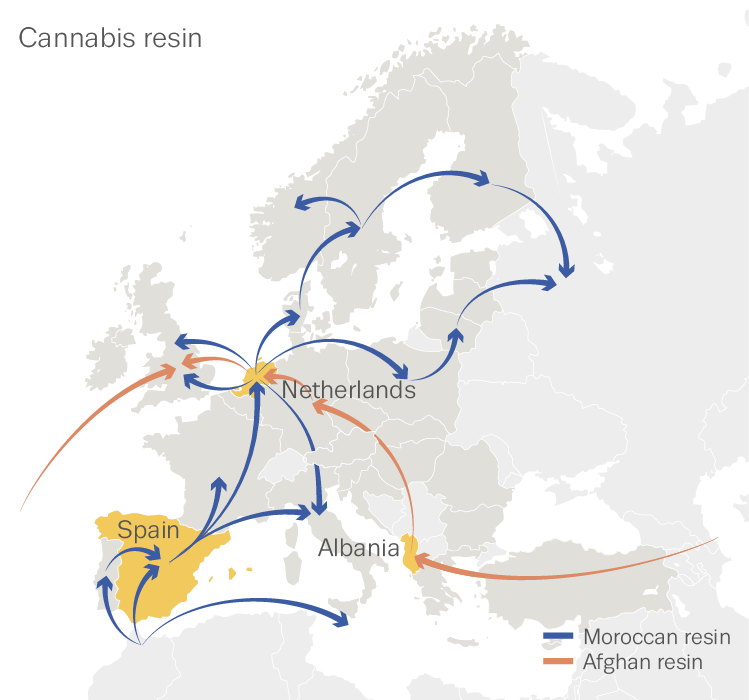 Moroccan criminal groups are major players in the supply of cannabis resin to Europe, sometimes in partnership with European OCGs, for instance Dutch and Albanian-speaking OCGs. Some Moroccan OCGs are able to control the whole chain of trafficking, from production in the Rif mountains to retail sales in, for instance, Marseille, France. In addition, their control over wholesale imports and sales allows them to exert significant influence on most markets in Europe. Albanian OCGs are reported to be involved in the trade of Afghan cannabis resin, mostly to eastern and central Europe and, via the Netherlands, the United Kingdom. However, it seems that the United Kingdom also receives Afghan hashish directly from south-west Asia. Suggestions for further reading will be added here shortly.